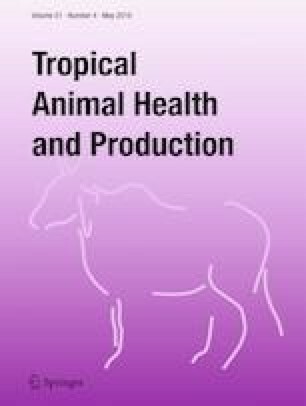 A retrospective study from 2004 to 2017 investigated the effect of bull age, cow age and breed on conception rates, and calving intervals of beef cattle at Neudamm farm, Khomas region, Namibia. Bulls ranging from 4 to 14 years of age were used to breed cows up to 17 years of age. A total of 1804 pregnancies were diagnosed in Afrikaner (81.8%), Nguni (14.1%), and Simmental (4.1%) cows. The overall conception rate of beef cattle during the study period was 71.7 ± 9.5%. The overall conception rate of the Nguni cows (78.3%) was significantly higher than that of the Afrikaner (70.9%) and the Simmental cows (64.9%) (p < 0.05). The age of sires had no effect on overall conception rate in all three breeds (p > 0.05). Afrikaner dams more than 10 years old had the least rate of conception (60.4%, p < 0.05) within that breed category. Nguni dams between four to 10 years had the greatest conception rate (86.5%, p < 0.05). Age of dams had no effect on conception rates in Simmental cattle (p > 0.05). The overall mean length of all calving intervals in the Nguni cows (366 ± 35 days) was significantly shorter than those of the Afrikaner cows (487 ± 62 days) and the Simmental cows (484 ± 110 days) (p < 0.05). The 2013 breeding season produced the highest overall conception rates (~ 85%), and the 2007 breeding season produced the lowest overall conception rate (~ 51%). From a fertility point of view, the Nguni breed seemed best suited for the semi-arid conditions which are prevalent in most of Namibia. The authors would like to thank the University of Namibia’s Neudamm Campus management for availing the data which was used in this research. The authors also wish to sincerely thank the University of Namibia for funding the publication of this manuscript. Anon, 2008. Nguni cattle [WWW Document]. Anim. Heal. Compedium. URL https://www-cabi-org.ezproxy.unam.edu.na/ahpc/datasheet/73374 (accessed 11.3.17). Stangroom, J., 2018. Social Science Statistics [WWW Document]. Soc. Sci. Stat. URL http://www.socscistatistics.com/Default.aspx (accessed 11.2.17).